Senators on Tuesday voted 30-1 to approve the state's two-year budget. It will now go to conference committee to be reconciled with the House version. The Texas Senate approved a two-year, $211 billion budget on Tuesday that would grow spending by billions while cutting property and franchise taxes. The bill will now go to conference committee, where it will be reconciled over the next few weeks with the House version passed earlier this month. Budget writers say the 2016-17 spending plan helps public schools, boosts border security and enhances employee retirement funds. A growing state economy makes those expenditures possible, senators said. 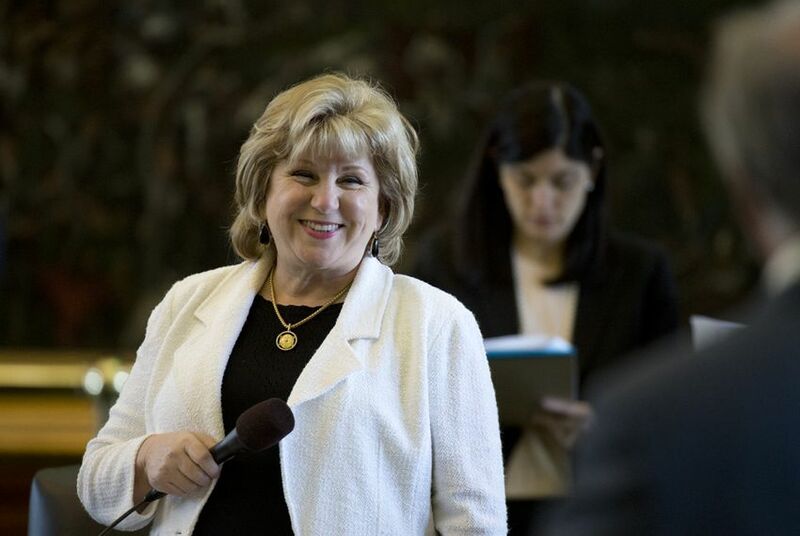 “This is a budget that will keep our state strong, prosperous and compassionate,” said Sen. Jane Nelson, R-Flower Mound, chairwoman of the Senate Finance Committee. The spending plan’s biggest discrepancy from the one already passed by the House pertains to taxes. After the Senate’s vote, Nelson and Lt. Gov. Dan Patrick argued that their approach to cutting taxes is best. The Senate’s plan is to cut the franchise tax by 15 percent and exempt businesses that make less than $4 million annually. The Senate budget would also allocate more than $2 billion to cover the costs of a local property tax cut. In all, that’s almost $4.5 billion worth of cuts. The leading tax cut plan in the House doesn’t include property tax cuts, but it does propose cutting the sales tax from 6.25 percent to 5.95 percent. The House has also proposed more than $2 billion in cuts to the franchise tax, including a 25 percent across-the-board rate cut. But Patrick said the House plan doesn’t account for those franchise tax reductions — and that’s a problem. When asked for his response, House Speaker Joe Straus released a short statement: "I want to congratulate Lieutenant Governor Patrick and the Senate on passing their version of the budget and we look forward to working with them in the weeks ahead." Overall, new spending in the Senate budget would increase by 4.6 percent from 2014-15. If the tax cuts were separated from the calculation, spending would grow by 3.5 percent. Senators debated the bill for about two hours before passing it. That’s far less time than the nearly 18 hours the House took earlier this month, when more than 300 amendments were offered. Under Senate tradition, senators rarely amend the budget at this stage in the session. In the end, the vote was 30-1 in favor of the bill. But there was criticism, especially among Democrats. Several Democratic senators criticized how school funding is handled in the budget. The bill includes more than $1.2 billion beyond what is needed to pay for enrollment growth. But some critics argued that the state still ranks near the bottom in per-student spending, and that schools are still reeling from cuts in 2011. Sen. Sylvia Garcia, D-Houston, meanwhile urged lawmakers to consider adding more dollars for pre-kindergarten. The Senate’s version of the budget included $118 million for that purpose, senators said. That comes nowhere near enough to pay for universal pre-K, said Garcia, who was the lone dissenting vote on the bill. Sen. Larry Taylor, R-Friendswood, who chaired a workgroup on education spending, said universal pre-K would have been too expensive. And he said he thinks the pain from 2011 cuts has been addressed in this budget, along with the 2013 spending increases. “I think we are generally above where we were in 2011 before the cuts,” he said. The bill also includes $811 million for border security, which is more than the House budget. That drew criticism from Democrats, who said the state was focusing too much on the border while ignoring other needs across the state. “I think people are going to look back and say, ‘In a fiscally conservative state, how did this happen?’” said Sen. José Rodríguez, D-El Paso. Nelson defended that expenditure by saying the federal government wasn’t doing its job of protecting the border. “I wish the federal government was assuming its responsibility so we could take that money and spend it on education, health and human service and other needs,”she said. Now, attention will turn to reconciling differences between the House and Senate bills on taxes, border security and more. Tuesday’s vote marks the first time the Senate passed a budget under its new leadership. This is the first session with Patrick presiding over the Senate and Nelson leading the finance committee. When the bill passed, members swarmed Nelson with hugs and congratulations.